The poll title and overlapping brackets indicate that you vote for what you think the average age is. I'm thinking that the average age the owners of ALL Porsches (old and new) is around 35-40 or younger. 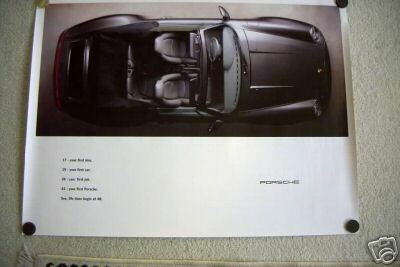 As I recall, Porsche's demographics for average age of new car buyers is mid-late 40's. It looks like data suggests the 45-50 year olds seem to venture out - perhaps to "newer" Porsches when they get more $$$ in the career, but then realize the horrendous error they've made and return to their "true love" - the 993 - at age 50 and above!!! Anyway, now that I'm back to driving the C4S everyday, it's just kinda boring using it for going up and down the freeway. And if we're talking "true love" I really thing my first significantly finished off 911 was it. A '79 SC 3.2 with the 7/31 R&P. Plus, it was at that place in life where I had few responsibilities. Everything up to that point was either a ratted one I just kinda kept running, or didn't fully function as a whole, unified car. "See, life does begins at 40." Took ownership of my 993 at 33. Lets see....40 years old now as of May, purchased at 37, and I have the maturity of a 25 year old! I'll still kick most of you youngsters asses on the ice hockey rink or on my road bicycle though! Sorry, see what I mean? I had to wait til 57 to get my first one and interestingly enough, since joining RL, I developed a minor jealousy (but happy for them) to the younger members who will probably be driving these cars for a lot longer than me. And then a funny thing happened-while coming out of store I saw a much older gentlemen and his wife admiring my car. We got into a conversation and as it turns out he has owned several Porches over the last 40 years He was originally from Germany and when emigrating to Canada he brought over the one Porsche he has never been able to part with-a lightweight 1973 Carrera RS, still in great shape. He still drives the car occasionally. So I guess there is still some hope that I will be driving my car for several years to come. First at 40, second at 43 and I'm now 44. No plans on selling this baby. I bought my first 911 at age 39. My average age has been increasing ever since. If we're really going to get critical about the study design, there may be some issues with the generalizability of these data. Older 993 drivers may be less likely to be members of this forum. Consequently, the study results may underestimate the true age-related prevalence rates of ownership in the older age groups.